The Pioneer USB-C PD Dock is a versatile expansion dock perfectly compatible with simple designed MacBook and Thunderbolt™ 3 computers. Need a serious boost for convenience and work efficiency? Just connect a cable to the USB-C terminal and you are good to go! The Pioneer USB-C PD Dock lets users operate intuitively and take advantage of a USB-C cable for productivity. It supports Windows dual-monitor display to further improve work efficiency. The flexible and functional Pioneer USB-C PD Dock is your perfect companion whenever you are home or in the office. Working anywhere with your laptop for efficiency is quite common. When you are back in the office, imagine how wonderful it is that a USB-C cable connects all peripheral devices together without dealing with cable clutter! The Pioneer USB-C PD Dock sets up your personal workstation by connecting monitors, keyboard, Internet and USB peripherals to your laptop with a USB-C cable. Connect or disconnect all at once! The Pioneer USB-C PD Dock is built by new connectivity technology. USB-C and Thunderbolt™ 3 can be connected by Type-C. With its high flexibility, the Pioneer USB-C PD Dock complements various types of computers and features all popular connectivity interfaces with just one USB-C cable. The Pioneer USB-C PD Dock is highly expansible. It provides three USB 3.1 Type-A ports, two modern USB 3.1 Type-C ports, HDMI, DisplayPort, Ethernet and audio (input/output) to turn your laptop into a personal workstation directly. The Pioneer USB-C PD Dock keeps users from juggling between power shortage and connectivity. You can charge your laptop by connecting to the USB-C PD Dock. What’s even better is that your cell phone can be charged simultaneously through the expansion port. Always keep it 100%! Connected to computer-The rear USB-C port of provides 5V/3A (15W) power output charging over two times faster than a standard USB3.0 port. Your smart phone or tablet can be fully charged easily. Unconnected to computer-The front-facing USB 3.1 port delivers 5V/2.1A (10.5W) stand-alone fast charging, which is 133% faster than a standard USB3.0 port. 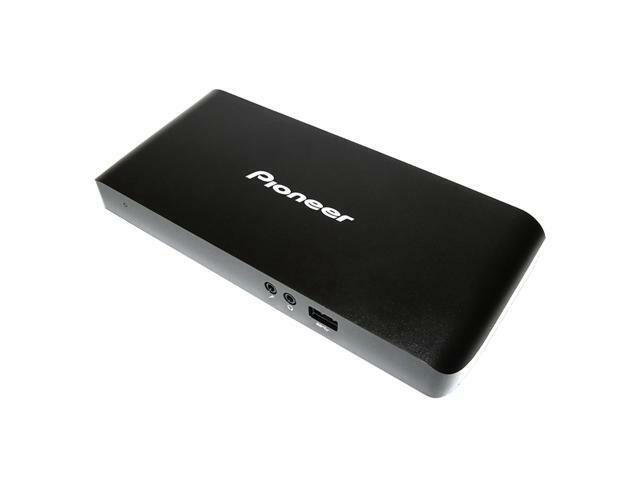 -The Pioneer USB-C PD Dock features full media output expansions, supports Mac OS and Windows and equips with HDMI and DisplayPort. Almost all types of signals are supported for the best versatility and flexibility. For Windows users-The Pioneer USB-C PD Dock can connect two displays at the same time. It supports to 4K @ 30Hz or 2K @ 30Hz & 60Hz. Simply build your personal workstation! For Mac users-Dual mirrored monitors can be easily set up with the MacBook and the Pioneer USB-C PD Dock to support resolutions including 4K @ 30Hz, 2K @ 30Hz & 60Hz and Full HD 1080p @ 30Hz & 60Hz.